Long shadows over Big Sky country. What could be a more unlikely breeding ground for noir fiction than Montana, whose wide-open landscapes seem the polar opposite of the mean streets of Los Angeles? Yet certain noir standbys prove both malleable and fertile in these 14 new stories. Among the most successful: Thomas McGuane’s cattle inseminator seizes a criminal opportunity his carjacker offers him. Carrie La Seur’s rising attorney is offered a chance to make her mark by uncovering some long-lost land applications by homesteading families. Walter Kirn’s brutish hero takes condign revenge when his virtual romance goes awry. Gwen Florio traces the intertwined yet hopelessly divergent paths of two old friends when one is accepted and the other rejected by the University of Montana’s graduate writing program. In the shortest tale, and perhaps the best, Jamie Ford’s female boxer returns home years after she ran away only to discover that her dying mother has left the family spread to the stepfather who first drove off the heroine. The co-editors’ two contributions follow an ill-assorted road crew to an inevitable payoff and pit a ski resort manager imported from Mumbai against a pair of firebugs, and David Abrams, Sidner Larson, Yvonne Seng, and Eric Heidle show that some noir setups, like the unwilling return of a native son or daughter who never quite seemed at home in the first place, are likely to flourish wherever they’re planted. Caroline Patterson, Janet Skeslien Charles, and Debra Magpie Earling round out a surprisingly distinct and distinctive set of evocations of different Montana localities that make this collection, like a successful package tour, greater than the sum of its parts. 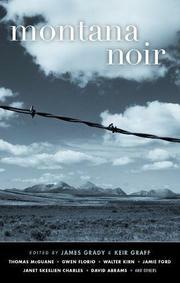 If Montana has a dark side, is anywhere safe from noir? Not Accra, Buenos Aires, or Santa Cruz, among the 17 spots next up for this prodigious series.